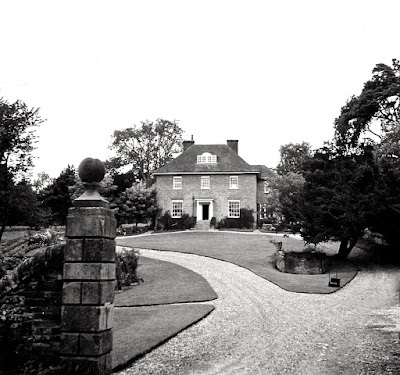 Wadwick was part of the Dunley Estate which Sir Alfred Herbert, my step-grandfather, owned near Whitchurch. After Sir Alfred died in 1957 ‘Granny’ (Lady Herbert, nee Nina Arundel, later Pugh) moved Dunley Manor to Wadwick House, which had become the 'dower house". The rest of the Dunley Estate was sold to Sir Brian Mountain of Eagle Star. She took with her as her housekeeper, the strict Scotswoman from Dunley, Mackenzie, and some other servants, but I best remember the two cheerful Sicilian nurses, Maria and Concita, who looked after her for many years when she was bedridden by a stroke. She was a Christian Scientist and declined to see doctors. My mother Annette used to drive to see her from Stocks every week, and I used to go along too and play in the garden or around the house, which is bigger than it looks in photos as it stretches back a long way. There was a baby grand piano which my mother used to play (and which came to Stocks after Granny died and which Piers now has). I used to be fascinated by a plaque on her writing desk which thanked Sir Alfred Herbert from the government for the gift of ‘One Spitfire Fighter’ during the war. Intriguing, I regularly run past this house and wonder what history lies behind the heavy iron gates. It is a beautiful spot with such a remote feel to it. quite interesting post. I would love to follow you on twitter. By the way, did you guys hear that some chinese hacker had hacked twitter yesterday again. Lady Gwladys Brocklehurst lived here from the end of 1946 (when she divorced her husband, Sir Philip Brocklehurst, of Swythamley Park)until 1952.